David Hayes - Tribute to Sammy Davis Jr.
An authentic tribute to two of the greatest performers of the 20th century, Frank Sinatra and Dean Martin. The show captures the music, the dynamic personalities and the comedy made famous by these entertainment icons. 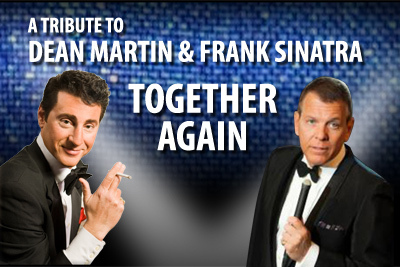 Frank is performed by Henry Prego and Dean by Joe Scalissi, two of the best tribute artists in the business to-day. They not only look and sing like the originals but also share their unique personalities and distinctive style. The show also features a live band and includes many of the popular songs made famous by these artists. The humor, charm and outstanding vocal performances in this show takes us back to a time in show business history where fun and great music captivated audiences around the globe. Henry Prego has performed as Frank Sinatra in some of the biggest and most successful tribute shows in the world. His natural ability to sing in the Sinatra style, along with his perfected mannerisms, sophisticated presentation and his physical resemblance to Sinatra places Henry in a league of his own. He is a seasoned entertainer who delivers the Sinatra style like no other performer. Joe Scalissi is considered to be the most authentic Dean Martin Tribute artist in the business. He looks and sounds like Dean as well as being naturally funny. He has an aura about him that captures the spirit of Dean with his laid back, sophisticated delivery. His rich, smooth voice delivered in a relaxed, carefree manner totally captivates audiences.